Yes, my dears, it's that time again: the CitySpotterGirl is switching off her computer, lying down in her hammock and she starts observing the clouds fly by. The traditional summer break is starting - and as always, instead of appointments, I am sending you in this issue all the best restaurant and shop tips of the last months. And I will also reveal the most important opening of the summer: the cult Berliner chain of shops Kauf dich glücklich is coming to Vienna! This nice store represents an entire way of life. People meet, chat, shop and eat. Kauf dich glücklich is: progressive fashion from Berlin and Scandinavia, home accessories, home-made marzipan or gingerbread ice cream and tasty tomato-mozzarella waffles. As well as chic design books and CDs. There are already 10 shops in Germany, and starting Friday, we'll also have one in Vienna. So, and now, take care, dear ladies. 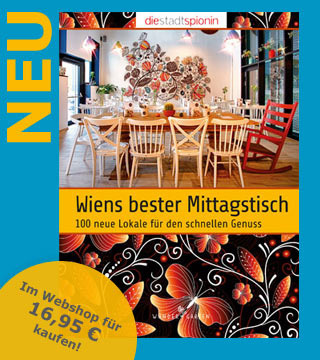 And if you miss the CitySpotterGirl too much, you can still go and buy her new book "Wiens bester Mittagstisch" ("Vienna's best lunchtime table") ;-) You'll find a sample here. P.S. We start again on 28.8. with the experts' special newsletter - and as usual on 4.9! Heavens, what a wide selection! Kurt Spet has brought over 3000 unusual articles from his travels to Vienna, and packed them in a stylish store. The colourful walls with their ice cream colours remind of Miami and the summer - and help orienting yourself. In the yellow and pink rooms, ladies will find the finest sweets (handmade chocolate from Calabria) and culinary specialities from all of Europe. Lime green and light blue contain mountains of accessories for home and garden: bird houses, cushions, flower seeds, lamps. And all of this at very friendly prices. How nice! What will the result be if a newcomer from a different profession teams up with trendy restaurant owner Ilhan Dogan? A gray-blue-minty café which prompts South Sea dreams with its retro-industrial style and its cosiness. The south also shimmers through in the food – from a manually arranged freestyle breakfast with mint spread to lunch with linguine al limone and courgette. You can also have the South Sea as a snack, for example in the form of a branzino sandwich. Recommendation: make use of the late-summer sun and look out for a nice place on the terrace! They call themselves “gardeners of feelings”, capture delicate honeycombs and the cornflower blue of the fields in their soaps. Invented in Riga, the Latvian natural cosmetics label Stenders has spread all over the world – now the first shop in Vienna has opened. Looks pretty nice with its interior mix of style and elegance and beguiles the nose with more than 300 scented products in the shelves. Essential oils or dried blossoms are used to make soaps, bath additives, products for hair and body care. And these aren’t even expensive considering the great quality! Yes, sometimes they improvise. Then everything that’s on the menu isn’t all available. Or it opens up later, because the kitchen is being rebuilt. Doesn’t matter, everything is so nice here at this new Irish’s place that nothing can bother us. Relaxed atmosphere, nice patrons, funny furnishing with lots of books (after all, the pub is named after Oscar Wilde) – and a damn great Irish cuisine. Perfectly juicy fish & chips, delicate burgers, scones – and my goodness, can the Irish bake good bread! The fact that Lane is also an organic shop is just the icing on the cake. Yes, it seems we have a new favourite shop now! In this new shop, designer Mark Baigent (from label Mark & Julia) gathers handpicked outlet pieces by young innovative designers from Vienna and Berlin and mixes them with vintage fashion from New York. Shirts by Meshit hang next to dresses by Mark & Julia, fashion by house of the very island can be found next to leggings by Pebelle and shoes by Petar Petrov, soon there will also be Lena Hoschek. And all these fine things are reduced by up to 70%! The shop itself is also quite casual: something between an opium den, Soho and bourgeois tiles. Old grocery shop reloaded! With her new “Greißlerei”, Andrea Lunzer brings a brilliant concept to Austria. There, packaging mania is forsworn, all groceries in the pretty store are “unwrapped”: the honey is in the container, sweet potatoes in the bag and flour, pasta and spices in glasses. There’s also cheese, fruits and oil. All bio, of course! One brings her own dishes to get the exact desired quantity weighted. (If need be, there are paper bags available at the shop). The pack service is also convenient: simply hand in a shopping list in the morning, and pick everything up in the evening. Office-caballeros such as the CitySpotterGirl are really grateful that so many nice and convenient snack places have opened up in Vienna in the last few years. There is now one more – and it plays in its own league: essenti, in the romantic Servitengasse, is almost the ideal version of the “quick” pub. Chef Marko Godinic, who used to work at Orlando di Castello, is a fantastic cook – and prepares just the right lunch-potpourri: real creative salads, self-baked sweetcorn bread and warm meals (yum, cranberry chicken), that simply taste so good. And well, the place also looks nice. Of course! The label exists since 2005, now Awareness&Consciousness has finally opened up its own store! In the small bright shop in the Lindengasse, the new spring/summer collection is already available: the Limited Silk Edition. This time, Christiane Gruber hasn't only coloured jersey, but also subjected silk to its own special colouring process. The result: dresses and scarves with spontaneous patterns - a small series of flowing and beautiful unique items, that almost look like paintings with their red-purple or grey-blue shades. It can hardly get more unusual than that. More lovable as well. The association Purple Sheep, built around Karin Klaric, helps well integrated asylum seekers who are threatened with deportation with the "protect friends house". Recently, the association also runs a pub on the Meidlinger market where asylum seekers cook meals from their home country. Exciting things are served every day for a donation: Chinese roast pork, Georgian mushroom goulash, samosas. It tastes good, it's organic, it doesn't cost much and it helps the association. Very pretty! And in all respects. 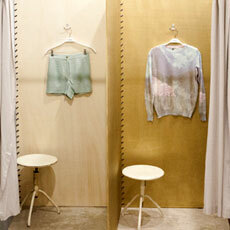 Martina Brückl has established a chic, carefully furnished secondhand shop on the Westbahnstraße. Brand fashion from Burberry to Esprit, Diesel jeans and a shirt by Cavalli: on 850 hangers, sorted skirts, t-shirts, dresses and trousers are hanging, and in between, visitors come across elegant bags, shoes and belts. Or scarves, that are stored in old sewing machine boxes. Only slightly worn or unworn clothes are sold (or bought) here! And if it doesn't fit, the in-house tailor can help spontaneously. Oh heavens, it looks so nice here! Das Kolin is a feast for the eyes consisting of three parts: a café that looks a bit like a French bistro, a small bar with an elegant counter and a gorgeous salon with velvet couches. The kitchen calls itself international, but it has a slight British touch - with sausages and mashed potatoes (yum!) or the afternoon tea served with scones, cream and marmalade. The burger is delicious too, as is the lemon chicken. The lunch menu changes everyday (for veggies too) - and the service is so nice as well! Oh heavens! If the windows weren't so suspiciously big, one could almost confuse the shop with a stylish apartment. Here, ladies can stroll comfortably through the airy showroom (or better, wonder-room): from the "office" with Scandinavian design desks to the "eating area" and "living room" with heavy vases and cool lamps by Diesel/Foscarini. The "kitchen" offers small fruit boxes and ceramic tuna cans from a Tuscan factory as well as fine silver. Price category: 1.95 to 2800 €. An exceptional concept store - interior freaks and nest warmers will definitely find their heart's desire at zimmer acht. We already know that Josef can bake (“the phinest”) wonderful bread. Since Monday he also shows us how to capture the "Zeitgeist" in a restaurant. Attached to his new bread boutique, he has opened a bistro which simply makes you happy. All of the used ingredients come from small, handpicked organic producers – there’s Birnstingl quince juice, eggs for breakfast from old chicken breeds and a delicious river trout. The breakfast tastes divine, afterwards lots of healthy food will be cooked all day, much of it even in the bread baking oven. And the restaurant: flooded with light, scarcely furnished, lively, bustling, urban. This is how you do it! Austrian designer Eva Poleschinski has an eye for unusual items. And that’s also why her boutique is anything but mundane: sales rooms and atelier are located in a splendid old flat, where one has to ring the doorbell first. The light and elegant frame fits fashion perfectly. Poleschinski, who was elected designer of the year at the Vienna Awards in April, is selling all three of her collections: the international runway collection EP ANOUI, as well as evening fashion and the cool “To Go” skirt that can also be worn as a dress, a cape or a T-shirt. So chic! Tip: The new grounds of the WU, the University of Economics and Business, are really worth a look. Alas, there are not many places in Vienna where so many star architects have built in one place. In the middle, you can find “Das Campus”: big, casual and unbelievably cool with its interior in a kind of industrial vintage style. The service is nice, the kitchen too: soups are served in preserving jars, burgers and tarte flambée taste good and the French fries are delicious. And as a special, the beer is “flavoured”. If this is what restaurants for students look like today, I want to be back at university! You notice right away that one of the owners is from the design scene: the new Chiq Chaq looks refreshingly good. Not only because the same lamps are hanging from the wall as in the CitySpotterGirl’s home :-) It’s colourful here, bright and welcoming. A bit like in a “chiq” American diner – and this impression is reinforced by the menu. There are burgers (also veggie! ), wraps and salads. Not in fast-food style, however, but prepared with care. You’ll find wraps with dates, goat cheese, balsamic vinegar and walnuts, and finally onion rings which don’t taste old. Thank you! Don’t be deceived! The huge flagship store stretching over 700 square metres and three floors may appear super posh – but for the Milan family Etro, it’s not about luxury. The goal of the company (founded in 1968 by the then 28-year-old Gimmo Etro as a cloth weaving mill) is to further develop traditional products in an unconventional way. And this is why exceptionally beautiful fashion made of wonderful fabric is sold here that may look elegant, but always has that certain something: colourful, lively, often with paisley-pattern ornaments – and above all, perfectly wearable. These ladies seem to enjoy playing hide and seek! First they cause a tumult in the whole city with their secret pop-up bakery and now they take up residence at the hidden side entrance of a church. Yes, you have heard correctly: the notorious Guerilla Bakery has settled down! In fact, directly in the little coffee paradise POC which has been enlarged for this purpose. With banana bread cupcakes to citrus cheesecake in a glass, the well-known baker ladies will now sweeten our lives every day. Starting next week: other dishes such as soups or breakfast will be served as well. frederik’s is notorious for its perfect catering, the shop with the same name has been in a former coffee house for quite a while now. But as of now, frederik’s shop is all brand-new: fresher, brighter and everything a little bit more modern. The offer consisting of living accessories and culinary specialities attracts urban foodies and aesthetes: olive oils by Frantoia, fragrances by Millefiori Milano, Scandinavian tableware by Iittala, candles by Bougies la Française. And above of all: here you will find lovely stuff and gifts you won’t find anywhere else in Vienna – such as handmade folders from Belgium. Visually everything looks like before, when the cafe at the Hundertwasser Kunsthaus was still called Dunkelbunt. But apart from that, everything is different. Vienna’s only vegetarian gourmet temple, the Tian, has taken over the restaurant and turned it into a casual bistro. Among round corners, a wave-like floor and jungle feeling à la Hundertwasser, there will be exclusively vegetarian and partly vegan cooking as of now, and of course everything is organic. And only meals that are quick to prepare: tarte flambée, delicious (!) gratins, sweets. Water drinkers can even get Granderwasser. Something exotic for the city! The newly-opened Mande Masa is a real stroke of luck among this city's boutiques. This pretty store exclusively sells African fabrics with their colourful patterns and turns them into clothes, jewellery and home accessories. There are festive blouses of precious, glossy bazin, belts and high heels of superbly printed wax fabrics, curtains of bogolan that was coloured with mud. Some cuts are African, some are European - an enchanting mix of two continents. So, the Kunsthallen Café at Karlsplatz is open again! Completely rebuilt (very chic!) with new tenants and a menu far from your usual standard meal. The name, "Heuer" ("this year") is a philosophy: they only cook what the season provides. And preserve everything they can. Before eating, one should observe the huge wall with its exquisitely filled canning pots: lemon zest in olive oil, poppy mustard and shrubs, as they call their homemade lemonade. The CitySpotterGirl's favourite food at the moment: maize-fed chicken from the clay oven. A delight for the palate!